If you’re a geoscientist and you can only go to one event a year, it’ll probably be the Fall Meeting of the American Geophysical Union (AGU). Next week, about 25,000 of us (yes, that many) will turn up in Washington D.C. to see our colleagues present new research and find out what’s new in earth and space science. There are so many sessions (600+!) and so many people that it’s hard to choose where to go and what to see. I’ll be there with about 30 Googlers from the Google Earth, Earth Outreach, and Earth Engine teams, talking to users and doing demos at our booth. But we’ll also be doing what the rest of the geoscience professionals are there for: meeting people and learning. Here’s what’s we like best about the AGU Fall Meeting. Even with all of our tools for online meeting and communications, scientists are one of those groups that really appreciates the value of face-to-face meetings. We could put a ton of information into emails and online presentations, but scientists would rather wait until they’re together at AGU to hear about research and products in person. Many of us on the Google Earth teams come from academia, so it’s a pleasure to meet up with the researchers and scientists we know from our earlier careers. I think we get a lot of mileage out of the after-hours events like the ice-breaker receptions and the “Story Collider” session, where attendees share personal stories about earth and space science. 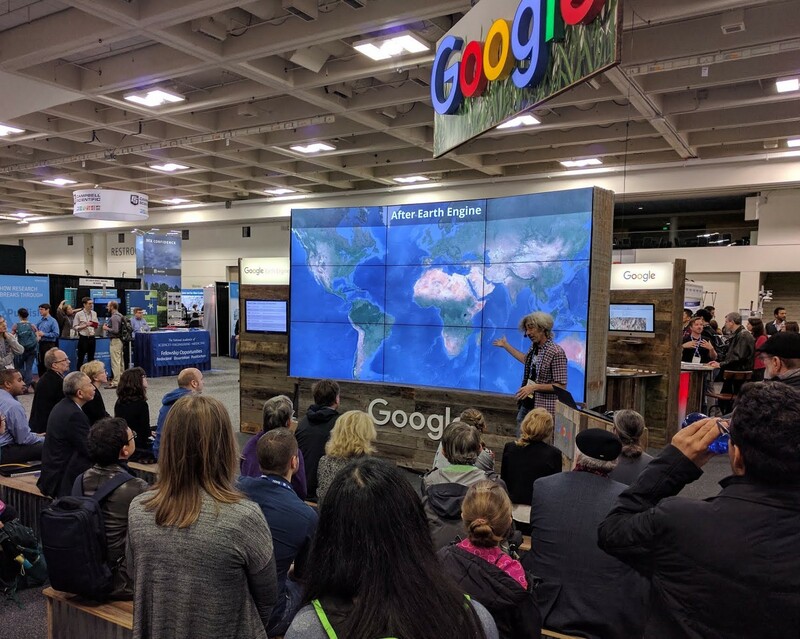 Some of the Googlers coming with me to AGU are new engineers, so they’ll be seeking out sessions on Global Environmental Change, Natural Hazards, Earth and Space Science Informatics, Education, and more. I like the idea of dropping these new folks straight into the deep end of geoscience. But there are plenty of sessions for people like me who are most excited about how technology can make geoscience information accessible to more people. At our Google booth, we’ll show what’s new with Google Earth Studio and Earth Engine, including how we’re opening up these tools to more users and adding new content features. Over the past few years, presentations have been getting more dynamic, thanks to AGU’s support for newer formats like eLightning sessions. They essentially combine short rapid-fire lightning talks with touch screens where presenters can show off images, animation, and text to attendees — much more interactive and engaging than paper reports. There are a whopping 700 eLightning presentations posted online, so we’ll have plenty to pick from. One thing that surprises outsiders is how broad the geosciences category really is. The common misconception is that geoscience is mostly about people with hammers looking at rocks. But if you look at the dozens of focus areas and groups that make up AGU, you see how they’re expanding the definition of geoscience, which is why we love to attend. There are presentations on policy and the human impact of geosciences — even subjects like evolution and creationism come up, which can make for the most interesting sessions. Another reason the AGU meeting is eye-opening is that everyone attending can submit abstracts and share their work. It’s a great place for new geosciences graduates to get their feet wet in terms of presenting research. This is why there are so many sessions to choose from — and it’s why AGU has become the hub for the geoscience community. Throughout the week, we’ll be highlighting all the best and most interesting features and content developed for Google Earth and Earth Engine over the last 12 months — including Landforms From Space, a new guided tour from our friends at NASA Earth Science. Interactive touchscreen displays will allow visitors to explore this content for themselves. Meeting the team behind Google’s Dataset Search. Learning about using Earth Studio to create Google Earth animations like you see in the media. Discovering how TensorFlow integration with Earth Engine is allowing us to parse even more information from satellite images. Exploring what the Earth Outreach team and partners are doing to impact conservation, air quality, and environmental change. If you’re at AGU this year, come find us at booth #1200, or follow the #AGU18 hashtag on social.